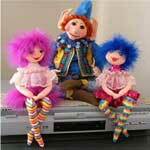 Dolls make loving companions for both children and adults. 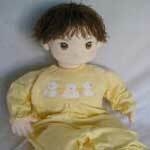 We have doll patterns for the baby doll that's a popular favorite of many little girls. Dolls that look like your little girl or boy are also a treat for both kids and parents. Taking care of a doll's needs helps children feel loving and caring toward their babydoll and others. 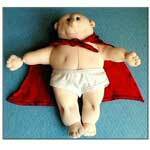 Here you will find patterns for adorable dolls made out of socks, one that resembles the cabbage patch doll, a teeny tiny 8 inch doll and many others. Sew a new addition to the family! This site has about 17 cloth doll patterns that look real. 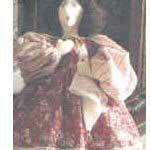 Patterns include Santa Claus, boys and girls, mini-dolls, baby dolls and more. 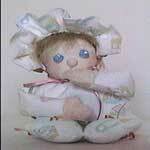 Pattern and complete instructions with illustrations to make this soft cloth doll. 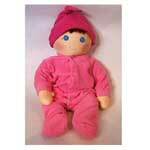 This cute stuffed baby would be a welcome addition to a nursery or a baby doll for a little girl. Scrooge is about 4" tall and can be a pin or an ornament. Unique tea cozy doll craft project. This angel can be made to kneel or sit. Create a lovely fairy doll with an angelic expression on her face using this step by step doll pattern. With an assortment of fabrics, prints and colors you can sew some great looking diva dancers. 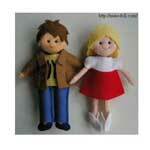 These little dolls are easy to make and are so cute. Use your creativity and create little dresses in prints of plaid, polka dot, flowers or whatever suits your fancy. This easy to make rag-a-muffin is soft and washable which makes it ideal for a baby to hold on to. 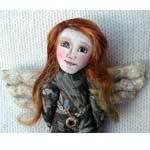 Start creating this beautiful fairy doll that has so many uses. 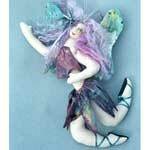 Once made you can hang this fairy from most anywhere you want her. Doesn't this baby look so sweet? This pattern is easy to follow and has illustrative pictures to go along with the instructions. There seems to be a lot of girl doll patterns but not so when it comes to boy dolls. Well here is an adorable little boy that is easy to create. These dolls are all about high fashion. Kids will love playing with these fashionista's as their clothes, shoes and even hair can be taken off and replaced with others. 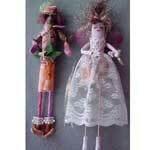 These little women measure 12 to 14 inches and several of them can be made in just a few hours. Fabric scraps work perfect for this fun project. Take time to make this lovely Japanese kimono doll using this sewing pattern. From head to toe this Japanese lady is in full dress kimono style. This precious baby has little angel wings, golden curly hair and an angelic face. 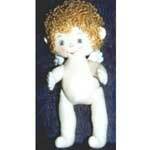 The project is extremely detailed to help you create the best baby angel possible. 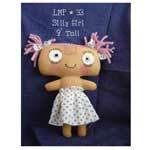 Most any little girl would love to have this quirky but charming little doll with pig tails. 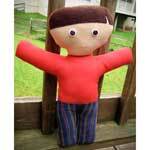 Create a best friend for your child or grandchild. 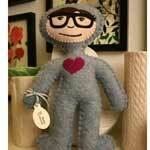 Homemade dolls absorb the love they're made with. 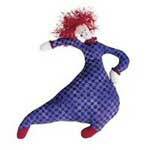 This sweet looking rag doll will give a child someone to hold onto. With her long skinny arms and legs, plus braided pigtails, this little angel girl is very unique. This guy makes a great Valentine gift and sends the message "you are the one!" He is made out of a old sweater which makes him soft and enjoyable to hold. Need a gag gift? This super hero makes the perfect gag gift for husband, dad or brother. Here is the perfect doll craft for kids. It's so simple and easy to make. This rag doll is so precious with her long braided pig tails. 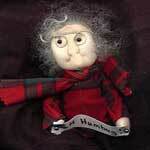 If you are a fan of Lord of the Rings you will enjoy making this little Hobbit sock doll. 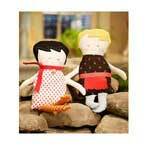 These yarn dolls are so cute, are easy to make and cost very little. Here is a beautiful Indian doll holding two foxes in her arms. These dolls from the ocean are side by side and very romantic looking. It is easy to make this sweet little mermaid with long flowing locks. 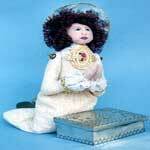 This site offers a pattern for a 31 inch boy doll. 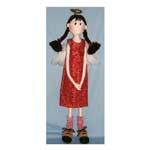 A 31 inch long girl doll with big brown eyes and long brown hair. 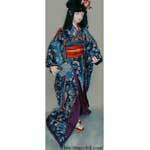 You can make an Oriental doll in full-dress kimono attire with this pattern. 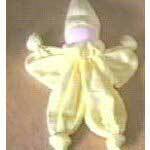 Using just a little cloth you can easily make this mini doll. Great for beginners.